How can I flip the edges in this picture in one algorithm if possible? If you want very short or even optimal solutions, you can use Cube Explorer. It can find optimal solutions for any cube position. This one can be done in 16 face moves, but no fewer. Online solvers are cool, but it doesn't really help if you want to learn because computers solve differently than humans. You'd be better off learning algorithms that flow smoothly and are easy to remember. The way I would solve your cube is by using 2 different edge flipping algorithms that are very easy to memorize and only use M and U moves. 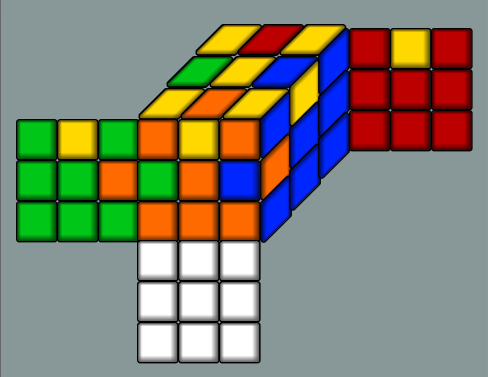 Now rotate your cube so that you have orange on the top and either green OR blue in front of you. Then you use this next algorithm which flips 2 opposite edges on the top layer. Also, both of these algorithms can be done extremely fast with some practice since they're only M and U moves and not something weird and slow using L, F, B and D moves in the same algorithm. In other words, I agree with Diminished's answer. Shortest algorithms suggested by computers are never helpful. What's wrong with this parity? How to swap two edges like this? What is the next method after 3-style in 3x3 Blindfolded? How would I flip an edge piece in a 3x3 without messing anything up except for flipping that one piece?